This Life in Progress. : Sausages, Sandwiches, and Sealing Wax. The ramblings and flights of fancy of a guy who seems to have good intentions on writing, but never seems to get around to it. Going to make a real effort. Don't have a direction, but who does, really? Sausages, Sandwiches, and Sealing Wax. Today, my family and I took a little trip at my suggestion. 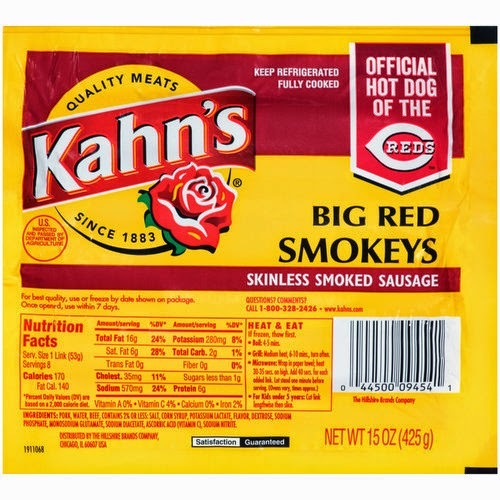 I am a great fan of a certain sausage made by Kahn's called "Big Red Smokies." For the uninitiated these sausages are about the size of a hot dog, but are packed with all kinds of flavor! I grew up on them as a kid and a trip to see the Cincinnati Reds play is not complete without consuming at least one of these. In the last few years, our local supermarkets have carried these sporadically and my wife and got them whenever we could. Well, in the last year, we noticed that they no longer carried them. We drove to nearby communities. No such luck. I finally wrote to Kahn's and received a prompt reply that we could only get this childhood favorite in two towns, both about an hour away. Today, we made the trip to one of the towns, an old favorite of mine called Greenville, OH. Let's just say, we bought plenty! My wife also suggested that we make a visit to an institution (No! Not that sort, although I know a lot of people think I belong in one!) of Greenville...The Maid-Rite Sandwich Shop! 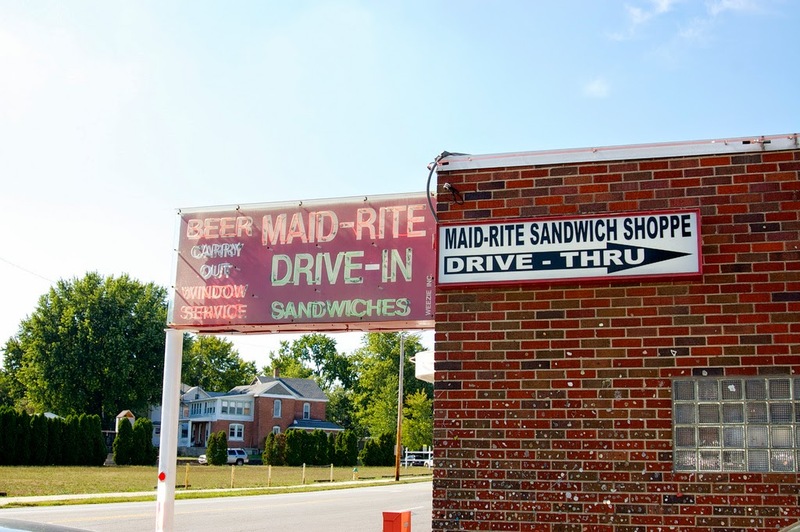 Now, I won't go into the history of the place because you can read it here....Maid-Rite History. I will tell you I went with sort of low expectations. Their claim to fame is a loose meat sandwich which is sort of sweet and I think has a little bit of spicy kick at the end. I was afraid that the bun would be sopping wet (I HATE wet buns). Most people eat these sandwiches with mustard, onion, and pickles. I prefer my sandwiches plain (even hamburgers) All I have to say is "WHERE HAVE YOU BEEN ALL MY LIFE!? These things are fantastic!!! We ate them up and ordered more to take back home! I've never done that with a sandwich before! Oh, if you go there (and you really should!) don't forget to indulge in a time honored tradition! 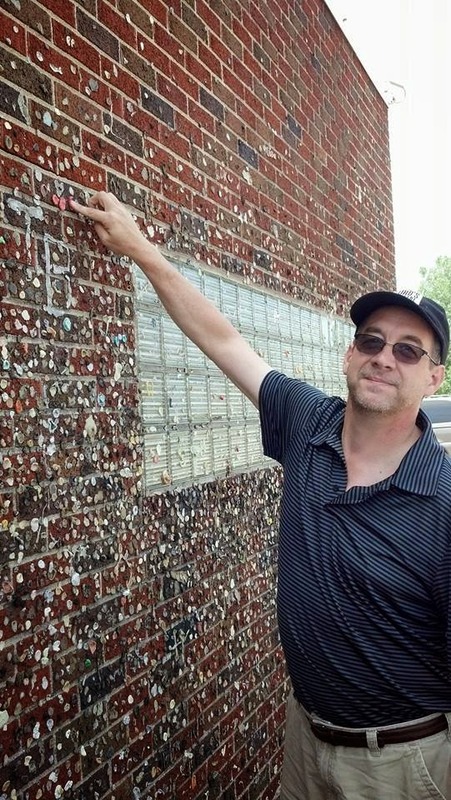 Put a wad of chewed up gum on the outside of the building! Like me! One final thing. Please visit this quaint town. It is about to close to Mayberry as you will ever get. 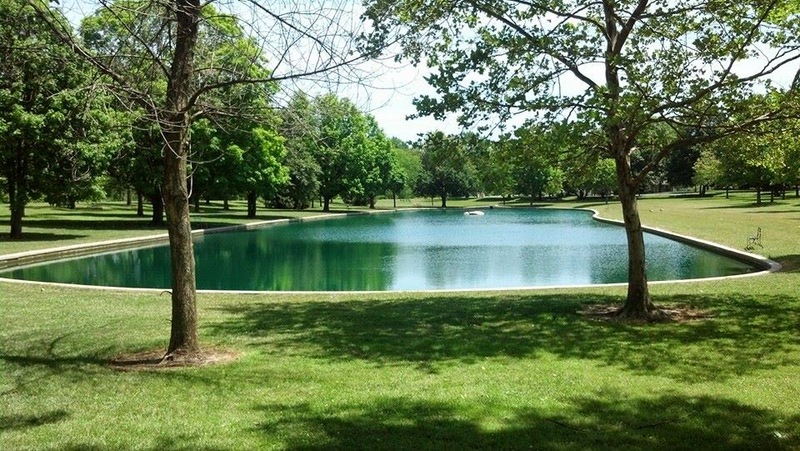 Beautiful homes, a park that is simply gorgeous, and a vibrant and viable downtown area! It is also the home to a great Kitchen-Aid store (they make KA appliances there) and the Garst Museum, where you can see a great exhibit on Annie Oakley (who my great-grandmother knew!) A lovely, lovely town that you should not miss! Some great shops in the downtown area! Well, that's today's blog. Hope you enjoyed it! I did enjoy it! Sounds like you all had a great day! Making Up Titles is Difficult. This is my introduction. I'm just a guy who wants to make a mark in this world. How? I have no fraggin' idea.